Things got much more wicked Monday when Netflix debuted the newest trailer of Chilling Adventures of Sabrina, which is set to debut April 5. Following her dark baptism, there’s something “different” about teenage witch Sabrina Spellman (Kiernan Shipka). Fans of the dark coming-of-age story first see Sabrina in the halls of Baxtor High School with a jug of gasoline. As she douses the linoleum floor, it looks like the young witch has every intention to set the building ablaze. “She may have signed her name to the Dark Lord, but that doesn’t mean she isn’t willing to raise a little hell,” the show’s bio noted. “But maybe it’s not so bad,” she concludes. Executing demons, levitating and resurrecting witches, it looks like the half-mortal first-year witch has already amassed much more power than Father Blackwood predicted. “I can choose to be afraid of my powers, or I can use them,” Sabrina says to Aunt Hilda. While the young witch is filling her wicked shoes, she still has some teenage-sized problems: mortal Harvey or warlock Nicholas? 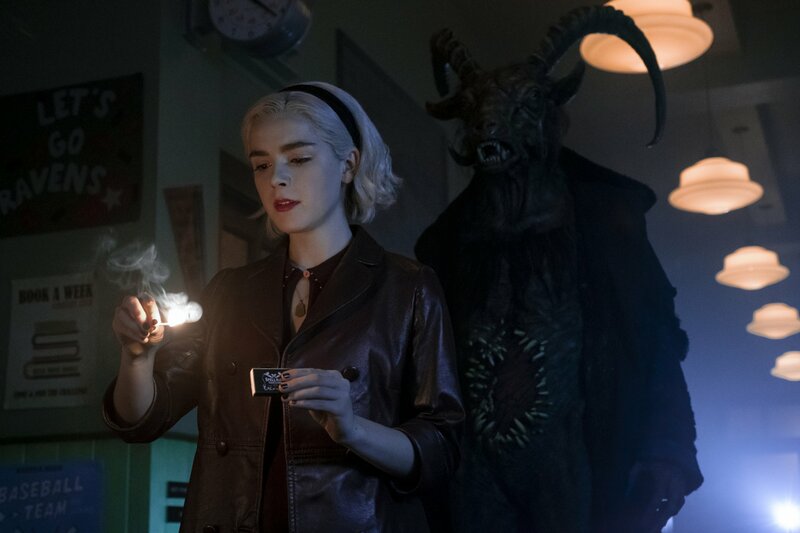 In the trailer, the love triangle is still very much alive as Sabrina tries to find a balance between her mortal and new dark side. “It’s something [Sabrina] fights and finds throughout the season as she is getting in touch with both sides of herself,” Shipka concluded. The latest trailer suggests that Part 2 will explore Sabrina’s experience of “getting in touch” with her witchy side. Arguably one of the most notable images in the trailer is of Sabrina levitating with a broom in hand, against the backdrop of a full moon. The trailer concludes with a teaser of the appearance of the Dark Lord. During Part 1, this character mainly appeared as a creepy, horned creature; however, now dressed in red satin, the Dark Lord has a meeting with Sabrina, noting that she has “loved” the power he has given her. “What is it that you want from me?” the young witch asks, as the screen fades to black. Find out what is in store for Sabrina when Part 2 drops on Netflix April 5.